Two of the most popular 2016 presidential candidates are Hillary Clinton and Donald Trump. With their popularity, Halloween costumes of these two will be highly sought after and in demand. 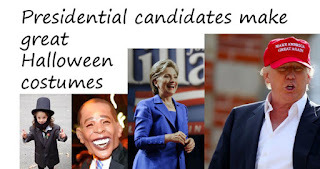 Visit How to make a President Donald Trump Halloween Costume and How to make Hillary Clinton presidential candidate costume. Be sure to carry a 2016 Presidential campaign sign and wear patriotic lapel pin to complete those costumes. A Halloween costume idea for couples is the current US President and his wife: Barak & Michelle Obama. One can make this a group costume by dressing as the Bo, the presidential dog, or the girls: Sasha and Malia.